Formula One management has teamed up with comms partner Tata Communications and the Mercedes AMG Petronas F1 team to launch a worldwide networking development contest. The F1 Connectivity Innovation Prize has been designed to showcase innovation around next-generation connectivity and collaboration technologies. Backed by a prize fund of $50,000, the contest will run over three rounds during the 2014 F1 season, with entries scrutinised by a panel made up of Mercedes’ Lewis Hamilton and executive and technical director Paddy Lowe, Formula One CTO John Morrison, Tata Communications F1 managing director Mehul Kapadia and commentator Martin Brundle. The first challenge, to be run ahead of this year’s British Grand Prix at Silverstone, will focus on the development and evolution of live data displays. The second and third challenges will follow later in the year, coinciding with the Italian and US Grand Prix meetings. 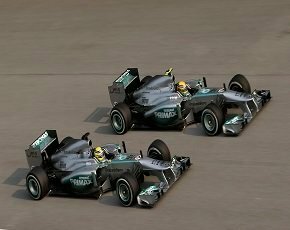 Tata Communications has been providing services such as remote connectivity, hosting and content delivery to Formula One since 2012, and last year became a partner and supplier to the Mercedes team itself. With both automotive and IT developments in Formula One frequently trickling down into business and consumer use, Tata has its eye not only on improving the experience for teams and fans, but on potential future applications. “Driving innovation is at the heart of our business, and the F1 Connectivity Innovation Prize is one of the latest initiatives that we are bringing to the world of Formula One,” said Julie Woods-Moss, chief marketing officer and CEO of nextgen at Tata Communications. Formula One CTO John Morrison said: “Technology has always been a hallmark of Formula One, so this opportunity to open some of our innovations to the world brightest minds is an exciting initiative.